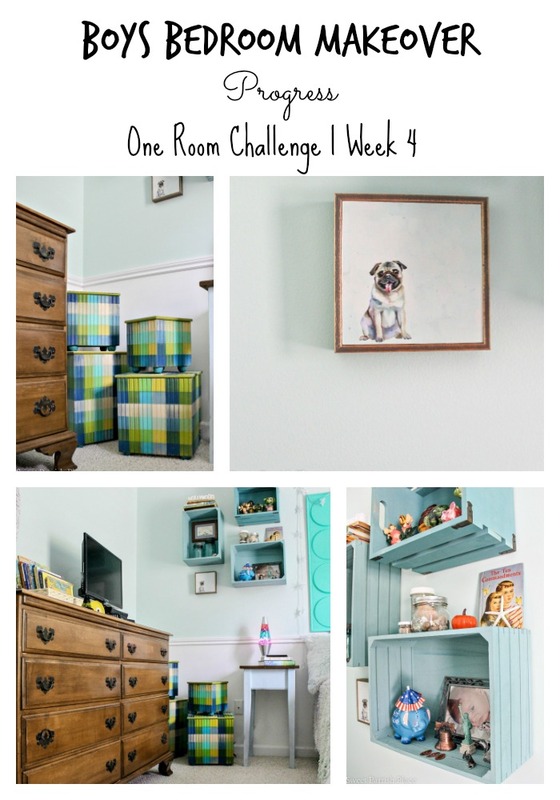 It’s week 6 of the One Room Challenge, and this week I’m sharing my partially painted nightstand and a sneak peek at some of the wall art I have added to the room. Hey friends! This is my last One Room Challenge post before the big reveal of my boys bedroom makeover next week, and we were actually given an extra week this time around for the first time ever, due to the fact that much of the country had been struck by weather related tragedy. 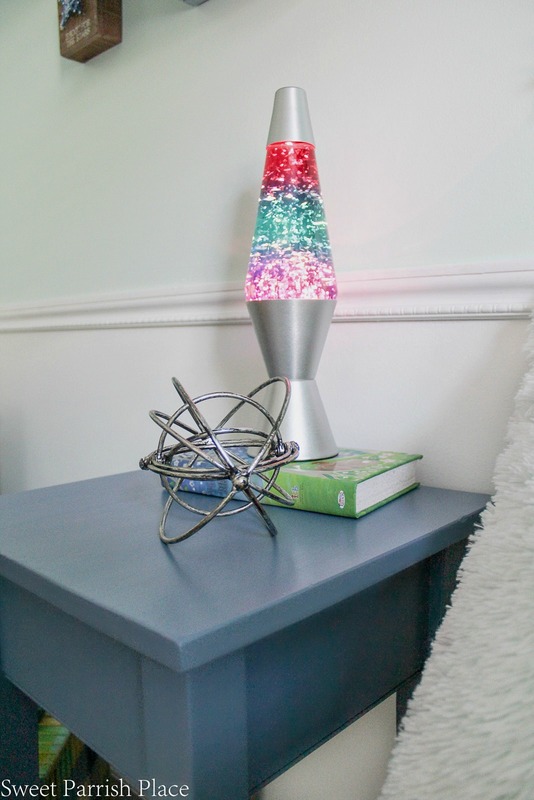 Before we get started with today’s post, you may want to go back and start at the beginning with week 1, week 2, week 3 , week 4, and week 5 of my boy’s bedroom makeover. I wasn’t sad about the extra week, I have to say. But honestly I don’t know how much good it did me, because I admit I became a little too relaxed, and now I am going to be scrambling this weekend to finish up those last few finishing touches that I should have already finished. 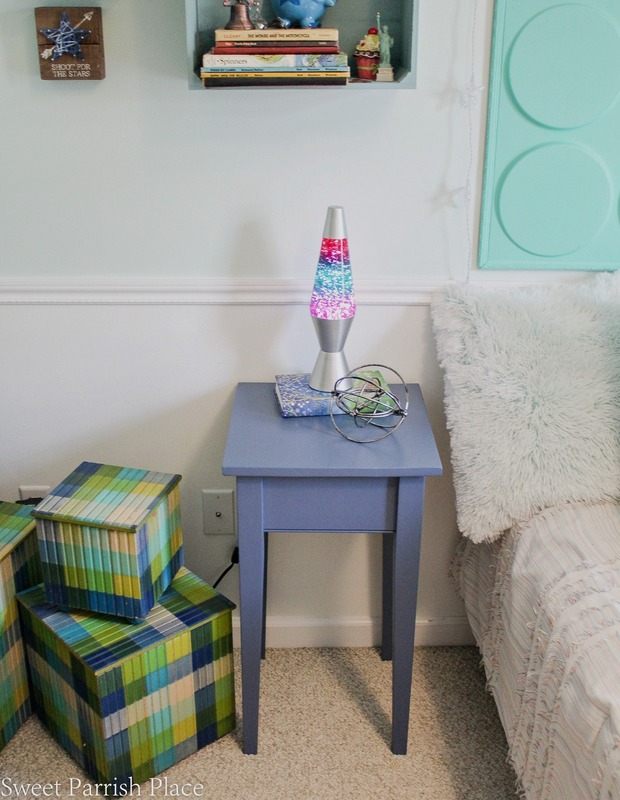 Today I’m sharing my partially painted nightstand and some wall art I have added to the wall over my son’s dresser. 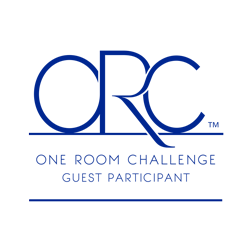 If you have not heard of the One Room Challenge (also called ORC), currently in its twelfth season, is a widely anticipated biannual event every April and October. Each round, twenty design bloggers take the challenge and transform a space. It is hosted by Calling It Home and House Beautiful. Wednesdays is the day for the design bloggers to go live with their progress, and Thursdays is the day for all the guest participants to go live. You guys will be amazed at these reveals, they are just beyond words good! If you found me through the ORC Link up, welcome! I am so happy you are here! My name is Nicki and I am the blogger behind Sweet Parrish Place. 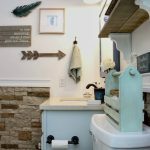 I love to share our DIY and home decor shenanigans, along with some organization, fashion, travel and other lifestyle types of topics. Thanks for reading! 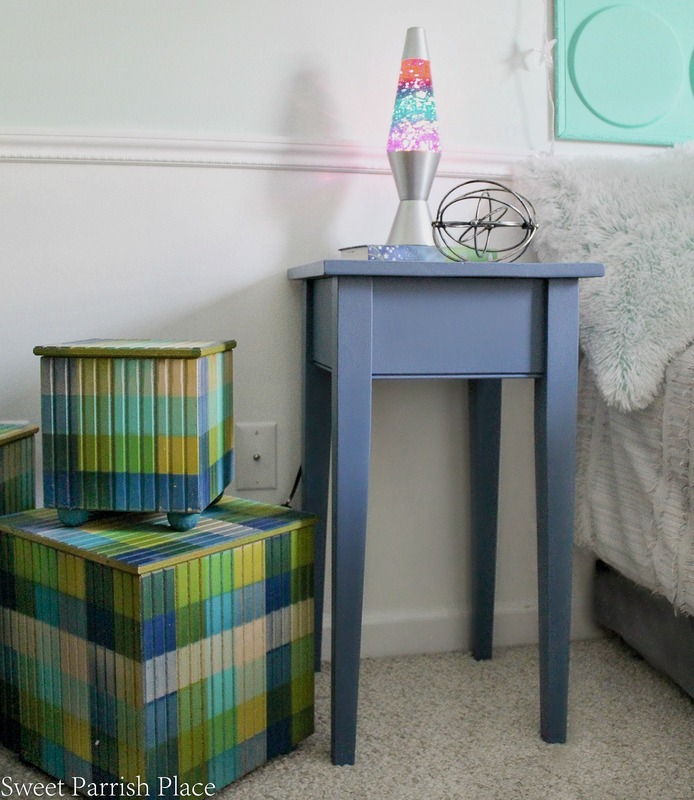 I wanted to paint this nightstand because I had painted it about 10 years ago to match my son’s nursery, and he is now almost 10, so it was overdue for a refresh. 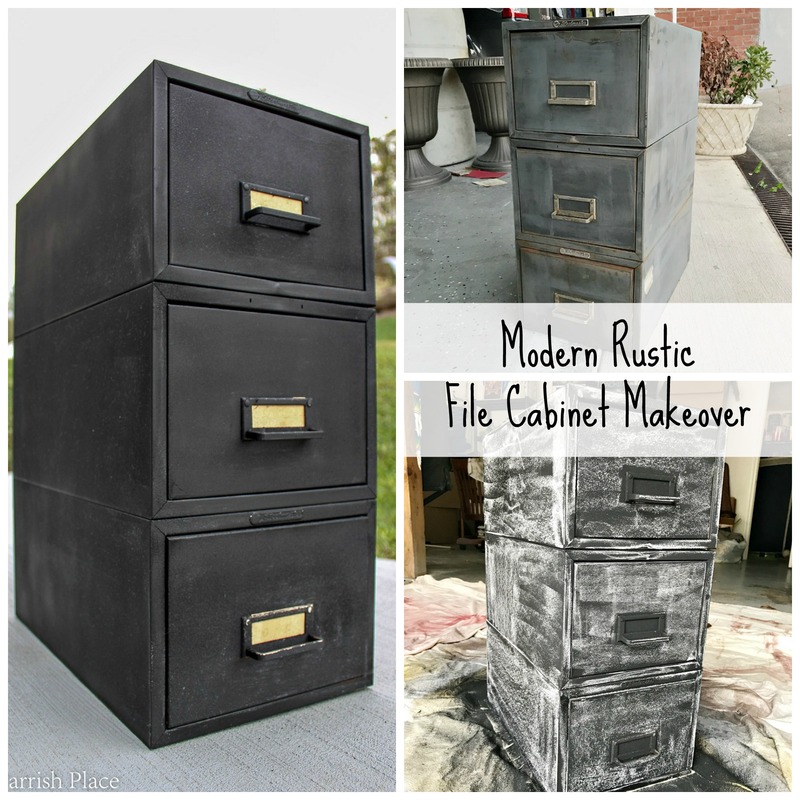 I had painted the legs baby blue and left the top wood, but it was scratched and worn looking. So I decided to paint the entire table this denim colored blue that I had left over from painting my 17 year old son’s bedroom. The name of the color is actually denim, and it is from the HGTV Home paint line at Lowes. I also used this paint to paint the bathroom mirror in my kid/guest bathroom makeover for the ORC last fall. It was almost a perfect match to one of the shades of blue in the cubes you see right in this corner. I sanded it down with my palm sander and then wiped the dust off with a clean rag, and then I painted on two coats with a slanted 2 inch brush. After it was all dry, although I liked the color, it was feeling a little boring to me, so I have decided to stencil a pattern onto the top of the table. I’m going to leave the pattern I have chosen as a surprise for the big reveal. 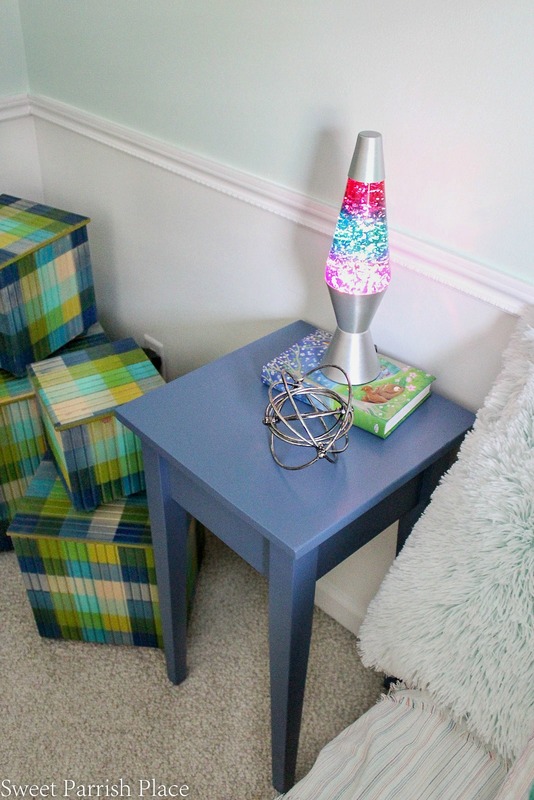 Even without the stencil though, I like the pop of blue this table now brings to the room. It brings in a tad more of a masculine vibe, which I wanted in the space. You may remember all of this art I have shared in snippets from previous weeks of this challenge, and I finally did get around to creating a little gallery wall with my collection that now hangs on the wall over the dresser and next to the mirror I painted for the room. It helps to soften the look of the TV that sits on this dresser. I have more art to hang on the wall, and two of the things are DIY projects that aren’t finished yet. I also have decided to use the pulls that are already existing on the dresser, but I plan to spray paint them gold to give them a little update. Hopefully I will like the results! And as I said earlier, I am planning to stencil the top of the table. I received the rug I purchased for the room just this evening and below is a little peak of it that I took after dark. I also have some styling to do and decluttering, and there are some small organization types of things I need to do in his desk area. Some of the toys will be removed from the room just for purposes of photographing the space. This little guy loves to play with toys, and it has been a battle to try to work on this room while he is living in it because it requires me to clean up every weekend to get the room cleaned up enough to photograph whatever I am posting about that week. Trust me when I say that what is in front of the camera may look clean and organized, but what is behind me isn’t always so. Stay tuned next week for the final reveal on this room! I will be SO GLAD to call this room finished and then be able to focus on Thanksgiving and Christmas. I have visions of sugar plums starting to dance in my head! Thanks Tammy! 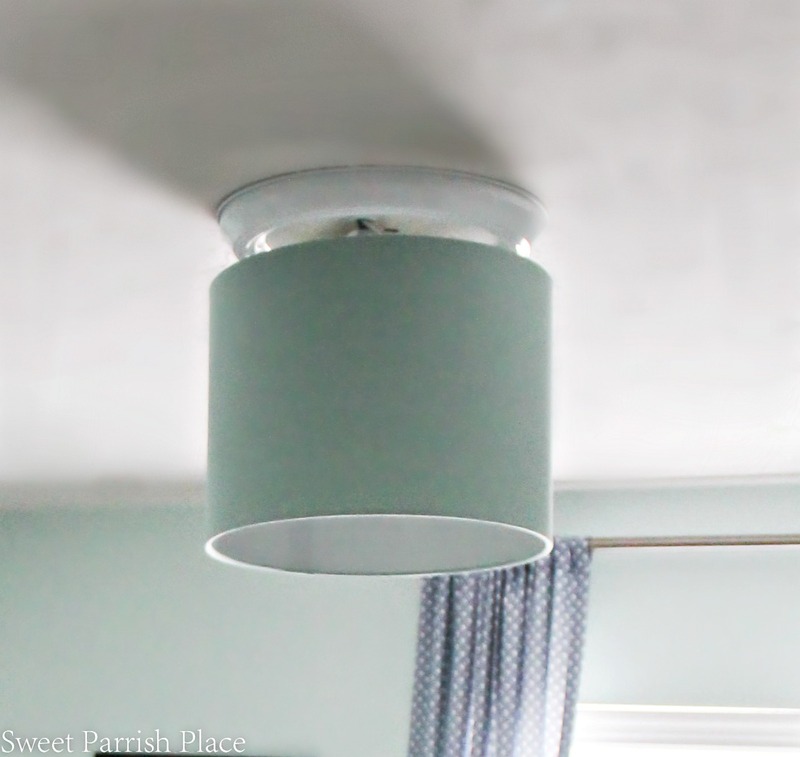 I have so much cleaning to do in there this weekend to photograph for the big reveal! yikes! does your son love the room thus far? I think it looks just phenomenal…and that rug!! Can’t wait to see it! He does love it, and now that it is finished, he is truly enjoying it! He thinks it dreamy! Thanks Lynn! I love the art! Looking good! Everything is coming together! You are so good at all of the details, like the artwork and the fuzzy rug, and I love the shade you painted the nightstand! Thanks for all of the kind words throughout this challenge Mary! Can’t wait to call this whole thing done! I love all that little gallery wall you did for this room. 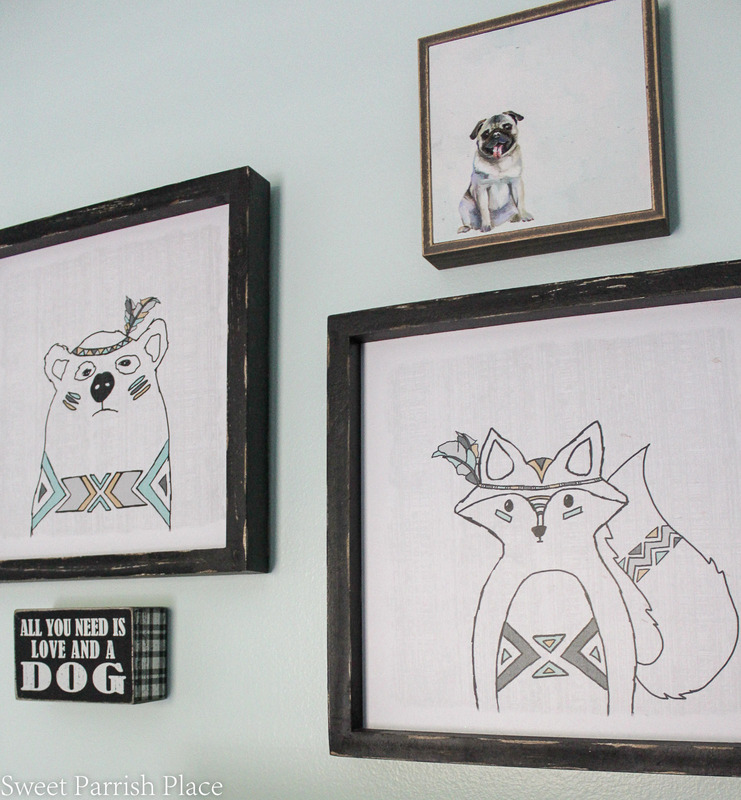 That pug print is super cute. I hear you about being excited to focus on Thanksgiving and Christmas now that this challenge is coming to an end. Can’t wait to see reveal! Thanks that Pug is a piece of local original art. Have a Happy Thanksgiving and Christmas! It is looking really good. 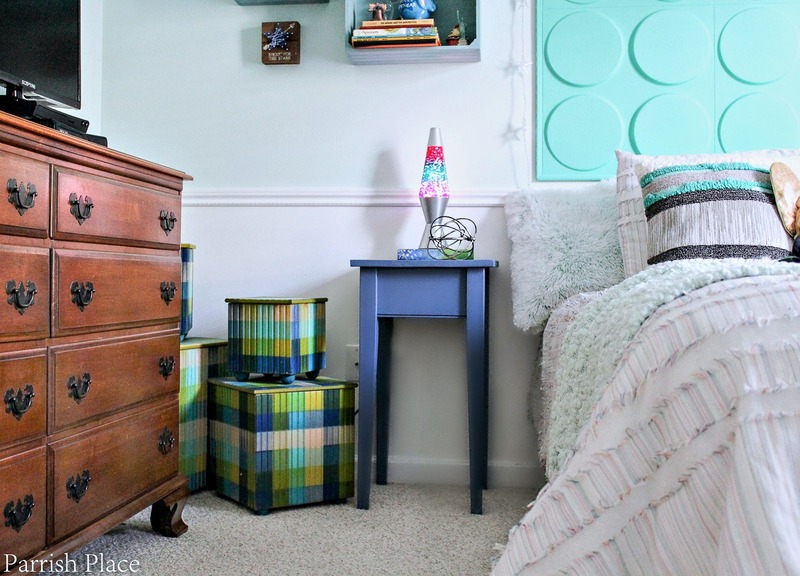 I love the color for the bedside tables , it looks great, and that rug is fantastic!!!! Super excited to see your reveal! Thanks Jen! I love the denim color so much. I can’t stop sprinkling it here and there! I love the delicious color that you used on the table that blue looks awesome . Thank you Angie. I love that denim color too and have used in a few different ways now! Love seeing everything come together! Can’t wait until next week for the big reveal! Thank you Lindi! I am so happy this room is finished, now my son can just enjoy it! He loves it! is that a dyed sheepskin?! love it! that nightstand also looks fab with a fresh coat of paint. Thanks so much! 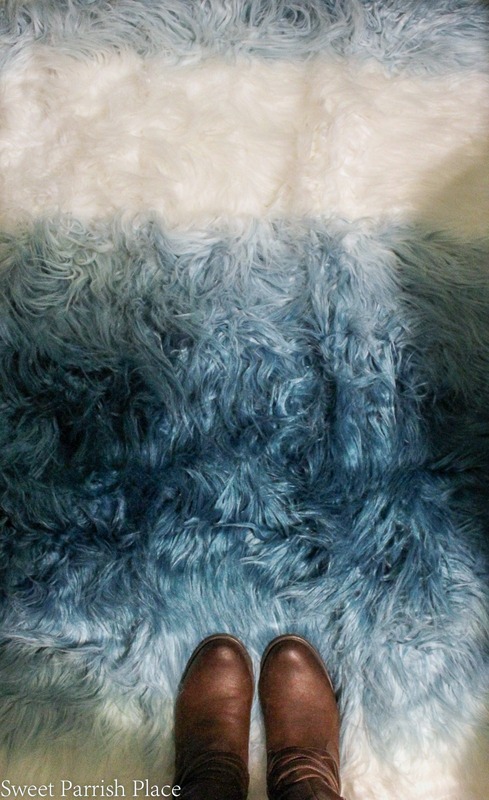 I bought the rug online at Walmart, and it does look like an ombre dyed sheepskin! super cute!